Big News: Sketchbook to Style 2.0 + We’re Moving! You may have noticed both in my posts here, and the weekly email resources, that there are some big changes coming up soon. 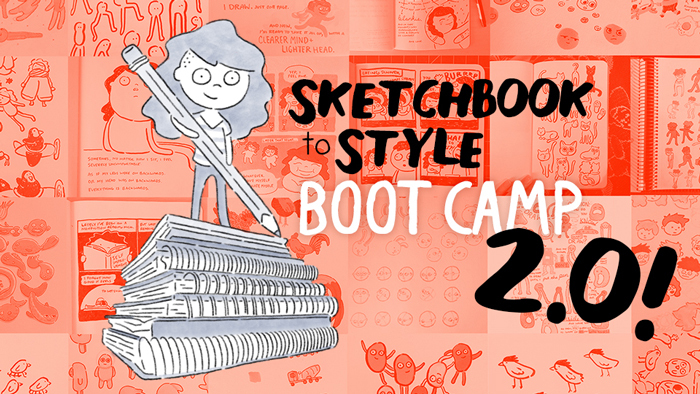 Sketchbook to Style Boot Camp has now been upgraded to version 2.0! We’re moving our community OFF Facebook! Woohoo! Ok, let’s get into some deets. For the course upgrade, all the changes have already been made, and the course is in the exact same place, so you don’t have to do anything at all! It’s all already there! If you’re interested in knowing what’s new and different, you can see what changes and upgrades I made to the course here based on your feedback. Upgrade #2: We’re Moving Off Facebook! Most large online courses like this one come with access to some sort of community. The standard way of doing this is to make a Private Facebook Group. That’s what I did for this course initially. It seemed to be the only viable option available for any kind of course discussion. But I was always unhappy with the idea of hosting our group on Facebook. Our little community did well there, but I could tell the platform was holding us back. I wanted something better. The major issue with using Facebook for this group for both me and my students, was noise. Facebook is just a huge distraction. Students told me they logged on to interact in Sketchbook to Style, and instead got sidetracked by baby pictures, job updates, and political rants. They ended up being pulled in multiple different directions, killing their motivation and inspiration. Facebook stinks at organizing and finding content. It was difficult to categorize or organize our posts and content in any way other than whatever chronological newsfeed algorithm Facebook decides to use. Facebook notifications are overwhelming. It was difficult for me to keep up with all your posts, because the notifications were all jumbled together with all the other events, pages, and people I follow on Facebook. And I’m assuming the same is true for you. We need a platform where we can control how often and how we’re notified. Facebook is kinda shady with the whole data/privacy thing, ya know? Basically, Facebook can do what Facebook wants, and as a group on Facebook, we’re beholden to Facebook’s rules. And I’m not on board with that anymore. Facebook only allows for shallow interactions. This was fine for our initial community, but I want something better. I want conversations that are not only easier to have, but also more meaningful. And I want more communication features and options. After a year on Facebook, I’ve found something better. Like, WAY better. The platform is called Mighty Networks. It started around 2010, and it has everything I want for you guys. Our group here will even have it’s own fancy name: Might Could Studiomates. I know moving isn’t easy. But it often means moving on to bigger and better things. I’m aware that some of you will not want to move or put in the effort required to learn a new platform. I understand. If that’s you, it’s ok. Don’t feel bad. But for those of you willing to put just a little bit of time to join this new community, I am confident you’ll love it. And I’m bringing you guys in early so we can grow this baby together. But What’s So Great About Might Could Studiomates? Find other artists in the community similar to you using member tags. Find other artists in the community who live in your city. 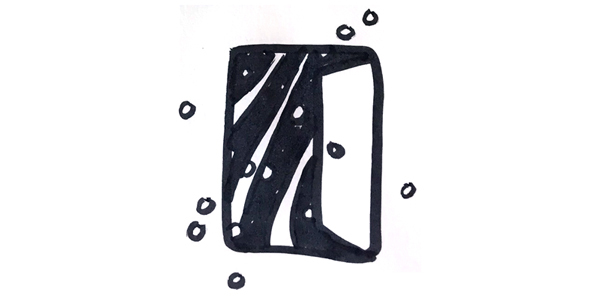 You could form and plan your own in-person drawing group through this platform! Your posts have more power and options. Instead of the limited post design on Facebook, you can now create posts that can do more and say more! 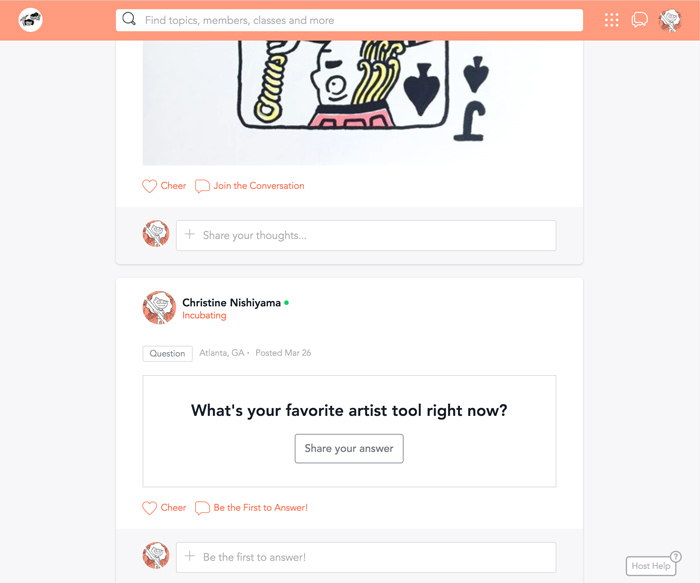 Ask questions, create polls, and upload photos easily. You can private message and group chat with members. There is a general chat room, a private course chat room, and private 1-on-1 messaging available all in this one platform. Imagine the live chat events we can have! And you can host your own too! And BEST OF ALL… all of this is available on an app! So you can do all this from your phone without having to access your Facebook app or a wonky mobile website. We’ve got our own app, baby! And it’s iOS and Android! Like I said, I’m inviting Sketchbook to Style students into this group early so we can build this together. I have a general road map I’m working towards, but all this will depend on your experience and your feedback. We can change and upgrade things as we go. For now, the group will only be open to enrolled students. I’m not opening it up to everyone at the moment because I want this to be a meaningful community where we nurture and encourage each other in our work. Perhaps in the future we can work to open it up more. For now, the group will be free for enrolled members. All of you will enter the group as founding members, and you will have free access to this community forever, even if we introduce a membership fee in the future. You’re all locked-in fo’ free. For now, there is only one course. The road map is to have a total of four courses that guide an artist through their artistic journey, and then releasing them into the world! The overall community will have elements outside these classes, but there will always be private groups within the community for each course. Welp, ok. I think I’ve probably officially overwhelmed you. But I’m just so excited about this, and have been so antsy waiting to invite you guys in. And now it’s finally ready! I really love this platform, and I know you will too. So c’mon over and try it out: click here to JOIN NOW!